Evolutha è rivenditore ufficiale di Objectviz per l'Italia! Il software per il riconoscimento oggetti adatto per grandi schermi installati su Tavoli Multitouch che trasforma il tuo prodotto in informazioni interattive visibili sul touchscreen. 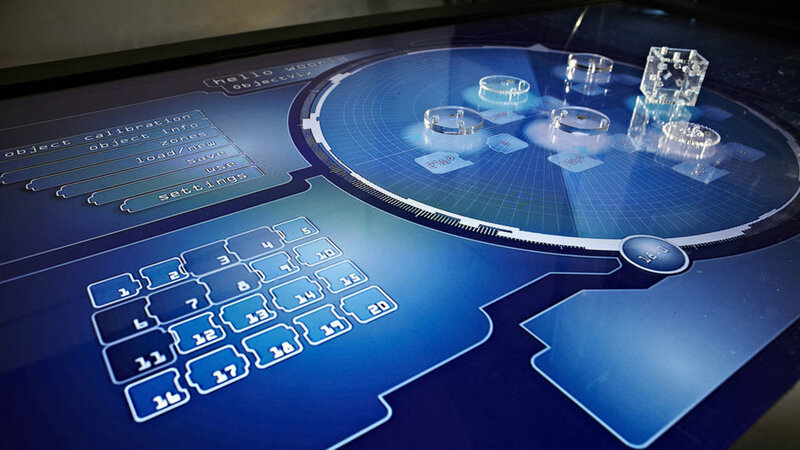 ADD A NEW DIMENSION TO YOUR MULTITOUCH DISPLAYS: THE PHYGITAL! Objectviz : the solution to track objects easily on every multitouch display. Identify : Objectviz identify your object. It helps you to turn everything into an interactive tool ! You can develop new applications and create specific contents for your object. Engage : introduce new contents to your users by inviting them to manipulate your products. Phygitalisation strenghtens your customer relationship. Engage your audience and boost your sales. Evaluate : ObjectViz provides a detailed report of every interaction. The software records the use of every phymarks. At the end of each session, a graphic informs you on their actions, manipulation time, duration and engagement rate. Therefore, you can adjust your user experience in order to make it better. Our solution for object detection on multitouch display. Objectviz allows object recognition without camera. For years, Object Detection have been limited to computer vison based systems. Computer Vision is weak, slow and suffers from occlusions and ambient lights. In order to solve this issues, we developed ObjectViz. How it works: Apply to your objects our transparent PhyMarks (physical markers), open our software ObjectViz, calibrate your object and that’s it! ObjectViz sends TUIO events to your application. ObjectViz works with every multitouch systems such as Infrared (IR frames), Capacitive (Phones, Tablets, Tabletops).